The following is the second part of the story telling my baby boy's birth. You can find part one here. It took place in Amsterdam, where we live and it focuses more on the journey my partner and I went on rather than the ins and outs of labouring with a midwife at home, and finally having a hospital birth in the Netherlands. I will write more practical information about what giving birth in the Netherlands was like in another post soon, but in the meantime you can read about what pregnancy and Dutch antenatal care is like here. Still standing in the bathroom, half-naked and not caring in the slightest, I thought about the hours that lay ahead and even in doing that I couldn't actually see the end goal of holding my baby. That still seemed so very far away. What I wanted was for these huge ferocious contractions to actually do something. I looked at Inge again and at the Om sign necklace she was wearing. If anyone was going to be pro-natural, unmedicated birth it was her. And here she was telling me that she thought an epidural was my best plan of action. Action... yes, I wanted action. "Okay," I said, feeling the oncoming canter of another contraction. "Let's go get an epidural." As we got our bags ready, secured the house and waited for the taxi, I told my partner how scared I was about the drive to the hospital. I also told him how frightened I was to be strapped to a bed and unable to move my way through the contractions. I told him I was scared about the needle going into my back. "Me too," he said. "Me too." It wasn't what I expected him to say, but it calmed me nonetheless. As it happened the taxi journey wasn't half as bad as I thought. Our driver was calm and collected and the drive was something of a distraction as the contractions came and went, as hard as ever, but this time I had a new audience. I reacted to this by swearing my way through them, something that made us all laugh once each one was over. A jolly Dutch hospital porter scooped me up into a wheelchair and speaking a mixture of Dutch and English, he helped us with our bags and the empty baby car seat we felt very clumsy carrying. As we walked down a long empty corridor, another wheelchair approached us. In it was a woman holding a baby wrapped up in a blanket, a man behind pushing them along. I remember closing my eyes to them as a contraction took hold. Still holding my baby didn't feel like the real goal of what I was going through. It felt like I had one hundred marathons to run before we got to where they were at. Once in the maternity ward, we met Inge again, and then I was immediately shown to a spacious and surprisingly welcoming room. A middle-aged female nurse was chatting away with Inge and I managed to pick up that Inge was explaining to the nurse that we wanted an epidural because it had already been a long labour. The hospital nurse said something to me in Dutch as she helped me into a bed, but I didn't understand, instead I just looked into her face and I saw a genuine warmth and concern. She didn't think I was pathetic for opting for medication. She thought I was brave and strong. At least that's what I told myself she thought. It didn't take many minutes for me to realise that going to hospital was the best decision I made. Almost immediately I began to feel incredibly safe and well looked after. While my partner had been a brilliant source of support during the previous two days, I had pretty much gone into labour thinking that I needed to do it on my own, that I was the only one that could get my baby out of me. While, yes, this is true on many levels, I didn't have to be physically or emotionally alone while I did that. I can see now how much of an ineffective approach that was to birthing my baby, and now I've done it, I look back on this way of thinking as madness. But now I was in a safe place, and although I found it unbearably uncomfortable to have thick and tight elastic straps pressing down on my belly measuring my baby's heartbeat, I didn't find it so bad staying in one position on the bed. Indeed I was finally resting in between those contractions that were speeding up in frequency. During each one I held on to the fact that soon, soon they wouldn't be quite so all-consuming. Soon they would fade a little, maybe completely. At some point during my first hour there, an obstetrician consultant came in and she checked me. I'd already dilated another two centimetres and at 4cm was officially in active labour. 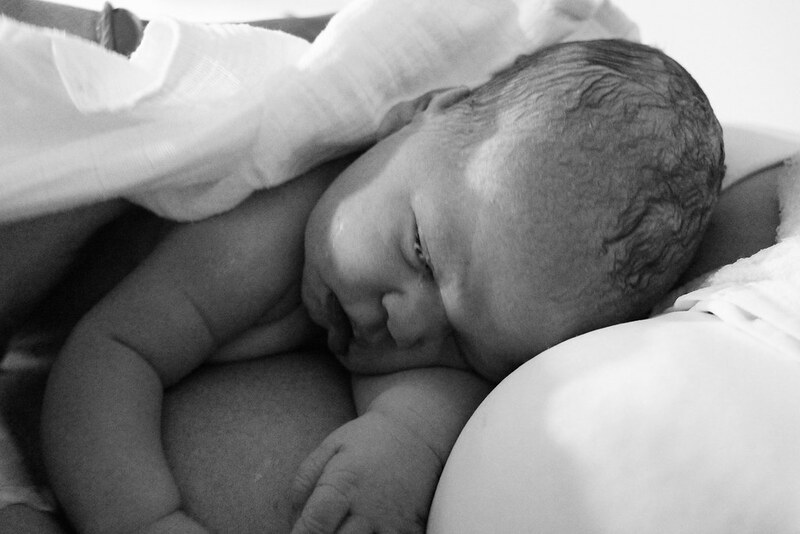 In between my breath- and everything-taking contractions, she spoke with me about my epidural. She said that she had tried to contact the on-duty anesthetist but he was busy with another patient. With a very creased forehead she told me that he wouldn't be able to give me an epidural before his shift ended. In other words, I wouldn't be getting an epidural. Without even hearing the words in my head before I spoke them, I asked her what other pain-relief medication I could have and less than twenty minutes later I was hooked up to an IV and self-administering remifantinil, a form of morphine. While I was anxious about the effects the drug would have on my baby - I was told it could make him drowsy - his heartbeat had stayed so strong and regular for the hour I'd been monitored I felt confident he was strong enough. Pushing was my goal now. And I knew I needed some relief and rest in order to get ready for pushing. At first I tentatively squeezed the little pump they'd given me to release each small dose of morphine. I was so nervous about my baby, and about the drug making me feel sick. Initially I felt no change in the pain, but I did feel as if I was more detached from it. After about ten minutes of being on morphine my partner asked me if it was helping. "I don't know," I remember saying with my eyes closed. "I don't think it's taking away the pain, it's just making me care a lot, lot less." And I remember smiling, something I certainly hadn't been doing previously. It certainly helped me relax in the short periods between contractions. With Inge sitting at the table next to me doing paperwork, I told my partner to sit down on the couch at the other end of the room and rest as much as he could too. I told him I was going to try and sleep in between contractions, which we both laughed at quietly. He reluctantly agreed and occasionally I would open my eyes to see him on his computer, every now and again looking up at me. Thanks to the morphine I strangely became more mindful of what was happening. I was able to feel how different the contractions were and how much more pressure and pain I felt in the very lowest part of my back. It was building with each contraction and after about forty-five minutes I felt I was at a stage when the morphine was becoming redundant. That was when the consultant returned. She stood by the side of my bed and asked me how I was feeling. "Okay," I whispered, or at least I think I did. I opened my eyes and saw that she was smiling. "I have good news," she said. "The anesthetist has finished with that patient and is on his way. We're going to prepare you for your epidural now." Within ten busy minutes I was sitting on the edge of the bed, arching my back and placing my head on my partner's shoulder. Inge stood next to him, her hands on my own shoulders. Behind me was the anesthetist, a tall, brusk Dutch man who looked like he'd just been dragged away from something far more important, was preparing to stick a needle in my back. "I don't know if I can stay still during a contraction," I repeated, suddenly terrified. "You will, you will." Inge kept saying. Out of nowhere I remembered how petrified my partner was of needles. "Don't look at it," I said to him. "Look at me, look at me." It didn't hurt. In fact it was over before I thought it had even started. Or maybe my pain threshold had completely readjusted itself thanks to the thunderous contractions I'd experienced. Just as the nurse and Inge helped me lie back onto the bed, I caught a look at NewMan whose skin was now greyer than the storm clouds outside. "Are you alright?" I asked him when we were alone again. "Do you mind if I just go out and get some air?" My first post-epidural contraction was just beginning. While it was certainly better than the ones I'd experienced before, there was still a lot of discomfort, but mercifully the unbearable back pain was greatly reduced. I simply started to repeat my baby's name in my head to get through it. When I opened my eyes again, I told my partner to go and take as long as he wanted. "Are the contractions much better now?" "Do you think you'll be able to sleep now?" He asked, gathering his things. "Then I won't feel bad going outside for a bit." "Yes," I lied and closed my eyes. I must have spent the best part of an hour on my own in that room, lying on a hospital bed, living from one contraction to the next. I kept repeating both my partner's and my baby boy's names in my head to get me through each contraction and although it helped, even saying his name and feeling his force inside me, I still couldn't connect what was happening in my body to the end result of me holding my baby in my arms. I couldn't even really think in fine detail about it to be honest. It still felt impossible. Inge returned eventually and she told me she was going to go soon. She'd already stayed hours longer than she needed to - strictly speaking once I was in hospital for medication, I was the responsibility of the hospital midwives not her - and so I thanked her with tears in my eyes. "I'm so glad you helped me see coming here was a good idea. I really do feel so much safer here." "I can tell. You're already at six centimetres," she told me. "Yes, when the consultant checked you just before the epidural, you're already at six centimetres so you're progressing very quickly." She stroked my hair and told me to rest as much as I could because I was going to need my strength. I closed my eyes again and went back to saying the names of the two people I loved most. When my partner returned he came straight to my side and I asked him to find me a drink. He found a can of fizzy apple juice and helped me drink it in between contractions. I told him that I was over six centimetres and he smiled. "I have a confession," he then said. "I went and had a beer," he said. "I had to. I just needed a drink after watching that needle..."
I think that was the first time I'd properly laughed all day. "Go lie down and rest. I'm going to need you soon," I said to him and I went back to waiting on each contraction and getting through it by saying those names again and again and again. A few minutes later I heard quiet snores coming from the sofa and I was only mildly annoyed that he was having the sleep I knew my body so badly needed. He woke when a woman came in with a plate of food. It wasn't really clear who she was bringing it to and she just placed it on the table to the side of the bed. Almost immediately I smelt the strong scent of cooked fish - maybe mackerel? - and I immediately felt very sick. My partner moved it outside and when he came back to the bed, I admitted that the contractions were still very painful. "I thought you were numb from the waist down?" "Well, not exactly..." I said and pointed to my toes as I wriggled them at the bottom of the bed. "Still at least you'll be able to feel the contractions when you need to push," he said as he knew that had been a worry of mine prior to getting the epidural. At around five o'clock in the afternoon I was checked again by a young woman who introduced herself as the new on-duty midwife. After only a very quick check, she told me I was nearly eight centimetres and I think that was the moment I started to believe that it was really going to happen, and soon. She and the lovely nurse I'd met when I first got to the hospital helped me get through some really hard contractions and then they left to go attend to a woman who was ready to push. Just before they left, I asked if I was allowed to have some nibbles on the cookies we'd brought as I hadn't eaten since early that morning, and they said yes as long as I didn't have too much. My partner then alternated between offering me cookie and fizzy apple in between my contractions, until it actually felt like I was constantly having a contraction. At this point I was starting to "lose it" during contractions. I couldn't regulate my breathing, I couldn't focus on anything but the blinding white heat of the pain that made my whole body compress. I longed to move, to get up off my bum, but I still had that stifling elastic band around my huge belly and I had more wires and tubes than I could count coming out of my arms and back. They were everywhere. I asked NewMan to find someone, which he did a few times but he was told that there were several women already pushing so no-one was immediately available. It was around this time that I first felt the need to push down. It's hard to explain other than making comparisons with, you know... doing a poo. You just feel this need to push something down and out of you. Because I was on my own and because it seemed too early - it had only been an hour since I'd reached 8 centimetres - I resisted the urge and literally grimaced and groaned my way through each contraction. Eventually the kind nurse came in and I told her I wanted to push. After helping me through the next contraction - puffing out her breath to encourage me to do the same - she said she would go and find the midwife. It took her a while to return, but in this time I'd gone from resisting the urge to push to not giving a monkeys and doing whatever I thought might make me feel better! Although it was still an excruciating agony, finally bearing down with my most inner muscles gave me a little relief and certainly a new focus. After one such contraction I looked at my partner and told him I was already pushing. Just then the nurse returned and she said the midwife was busy, but if it felt like the right thing to do, I could push if I wanted. So I kept going. Officially, on paper, I started pushing quite a bit of time later, at around 7 o'clock in the evening when I finally measured the much hallowed ten centimetres, and indeed with the young midwife at the end of the bed, and the nurse and NewMan on either side of me, my efforts for the next hour and a half were considerably more passionate and full-on. I was so panicked I would waste a contraction that I tasked NewMan with watching the monitor which showed when a contraction was beginning and ending even though I could still feel them, and while I knew the midwife was giving me several instructions from her position, it was the nurse on my right that I listened to most keenly. She was the one breathing with me through every contraction. She was the one counting down in Dutch while I held my breath and pushed down with whatever strength I could muster. It was her hand in mine that I can almost physically recall. By this point they'd inserted a chip onto my son's head so they could better monitor his heart rate and mercifully the elastic straps were off my stomach. I could move! So after nearly an hour of pushing, at a point where I felt each one was useless, I was helped onto my side. But this felt all wrong and after the following contraction I went back to on my back, my hands pulling up on my legs so that my knees were almost in line with my ears. My partner kept telling me he could see how much progress I was making because of the wire coming out of our son's head and out of me. "It's got lines on it so I know how far you've pushed," he said. That was great when I had a good push, but when I had a poor one and he didn't say anything about how far the wire had moved, I just felt distraught. "I don't want to know what stage we're at until I've got one push left," I called out to anyone and everyone. "I don't want to know until I'm just one push away from seeing my baby." And because nobody said anything, I just kept pushing, and pushing and pushing, and feeling physically surprisingly able, but mentally, oh, mentally I was falling apart. "I can't do it, I can't do," I gasped. "You can, you can," NewMan leaned into me. I was aware of the funniest things happening while I was pushing. I remember the midwife using her finger to apply pressure to me "down there", telling me where I should focus my pushes. I remember her applying scorching hot wet towels to me, that I yelped at, but felt I couldn't complain about because that burn was only a small part of the total pain my body was enduring. I remember believing with all my body and soul that I was going to split open in two, and that that was the only way my baby was going to come out. And I remember the nurse on my left, helping me through each push, her hand in mine the whole time. "I can see the head," said NewMan eventually, and I tried to ignore it. To even think that this could be over soon would surely be foolish. But he persisted. "It's so close, Frankie, you're so nearly there." I continued to dismiss this until I physically couldn't because then I could feel my baby's head. Hard, solid and round and forcing me open in a way I thought I'd never recover from. "The ring of fire" one friend had called it and my goodness, that is the most perfect description. It'll be over soon, I told myself. Except it wasn't. It took three more contractions for my son's head to come out. Those were the hardest most excruciating five minutes or so of my life. Once it was out I didn't feel much different. I just focused on finding my breath, thinking that if I could just breathe again and again and again, I'd find the strength somewhere to get the rest of him out. Besides, the midwife hadn't yet told me I only had one push left, so I needed to hold on, stay strong, there was more work to come. "Here comes another contraction," My partner said looking at the monitor, and when I looked at him I saw he had a camera in his hand. And he was smiling like I'd never seen him smile before. I closed my eyes and pushed down. "Open your eyes, Frankie, open your eyes!" It all happened so quickly that I didn't open my eyes in time. I first realised my son was born by feeling his weight on my chest, not by seeing him or hearing him. I felt him. All of him. And he felt incredible. Soft, wet and oh so wonderfully jelly-like. I located his head and held on as tight as I could without hurting him. Then I opened my eyes and saw nothing but light. I looked around to try and get my bearings. Slowly I focused on my partner's eyes. They were moist with tears. I then looked down again at the lump of life I was holding on my chest. Then I let the real pleasure kick in. No, not the "Oh my goodness I have a baby" joy. Oh, no. My real joy was that I was no longer in labour. There would be no more contractions. There would be no more pain. This was, of course, only partially true. There were a few more contractions then to deliver the placenta and many more over the following days as my uterus shrunk. And little did I know how much pain I would be in for quite some time after. But honestly, nothing made me happier, in that moment than knowing I was no longer where I had been. Even, I'm embarrassed to say, holding my newborn baby, my first child was momentarily, much less of a pleasure. Until, of course, a few breaths later, it was the only thing that mattered. "He's here, he's here, he's here!" I finally said, laughing out loud. "He's really here!" Still to this day, it shocks me that I - a person who cries at adverts and songs and books and people just being nice to me - didn't cry at the birth of my first child. I was just too overwhelmed with amazement and relief and pride. Bloody hell, was I ever proud of myself. I wrapped him up as best I could, but my arms were so exhausted from pulling my legs up that I could barely lift them and I couldn't move my body because it felt like I was sitting in a puddle of stuff that I shouldn't risk moving about in. I just used my hands to feel his whole body and I savoured the weight of him on me. I will never, ever, ever forget how that felt. As the moments passed, I realised he was yet to cry and I expected the nurse or the midwife to show some concern about it but they didn't. They were busy delivering my placenta and checking me for tears. I eventually said something about this but at the same time he finally started to make a noise which turned into a big, ear-splitting cry, and of course, as soon as it started I wanted it to stop. The nurse gave him another quick rub with a towel, put a hat on his head and gave us another clean blanket to cover him with. Then I went back to just holding my boy trying to soothe him until he went quiet. Minutes must have passed before I realised I'd not yet looked at his face properly, he'd just been scrunched up on my chest. So I gently rolled him to the side and looked at him. Much to my surprise he opened one eye, then the other, and then closed them again, as if it was all too much for him. I couldn't blame him. "He looks like you," I told my partner who nodded as if he'd been thinking the same thing but didn't want to say it. "I'm so proud of you," he told me and he kissed me. Time to go home... already! After being informed that I mercifully didn't need stitches and that the midwife had to go attend to another woman on the cusp of giving birth, the nurse stayed with me briefly and helped me try and give my son his first feed. I was utterly clueless as to whether he or I were doing anything right, but the nurse nodded at me as she went about checking monitors and moving some of the equipment from around the bed. I kept my son at my breast until I noticed that he had fallen asleep again. And then we were left alone, a family of three. I was wide awake and wildly alert, as if I hadn't just gone through a single exhausting minute of what I'd gone through. I was in disbelief at what I'd just done... and that I was still alive. I was shaking. I'd had the shakes on and off since having the epidural but I remember really feeling them and worrying about them once the contractions had stopped. I was bathing in the most delicious, delightful relief, that it was all over. I was brilliantly, profoundly proud of myself. I had surrendered and I had survived. My son was born at 20.37 on that stormy Sunday evening, and at some time after ten o'clock that night a nurse assistant came in and took him out of my arms. She weighed him - 4098 grams or 9lbs! - and helped his father dress and put a nappy on him. Then my partner sat down and held his son in his arms for the first time. Briefly I picked up my phone and checked a few very sweet messages but then I went back to just staring at my boys together. NewMan was stroking our son's feet, which he seemed to respond to by stretching out his arms and slowing his breath. "I think he's asleep," NewMan said eventually. I reached for my phone again to take a photo of them but it fell and because of all the wires, and tubes, and mess I couldn't move to pick it up. I have both deep regret and a strange contentedness at not taking that photo. Regret because it would have been beautiful to capture the happiness on my partner's face. And yet I feel content because this means I'm going to have to work extra hard reliving that moment in my memory so it stays vivid and real and forever with me. In fact, more than a year after what I like to call my "all-weekender" birth experience, I can still remember so many moments vividly. I'm grateful of course that much of it has faded into a soft, warm glow and I know that even though I think I can remember the pain and fear and desperation I felt at many times during this experience, I also know that I can't really, because that's what our clever bodies ensure happens. Otherwise we'd never be crazy enough to even consider doing it again. But you know what? Unlike so many, many women, I look back on the birth of my baby boy, from start to finish, from mild discomfort to unbearable, destructive pain, from wanting a natural birth in the water to having a medicated, hospitalised birth stuck on a bed, and I feel positive. I have no regrets. And this is quite an unusual thing. So unusual that I'm almost embarrassed and guilt-ridden to admit how proud of myself I am, because I'm so accustomed to women bearing the weight of their guilt and sadness and trauma and disappointment and I feel like I've betrayed them by having a different experience. I think this only serves to highlight how profoundly unique every single birth story is. No two births are the same, even for the same woman. So I'm going to hold on to my happy, proud birth story, and I'm going to quietly celebrate that I didn't just birth a baby on Sunday 26th July 2015, but I also gave life to a new mother too. Me. The title of the blog posts telling this story includes the phrase "Birthing without fear" and this is a concept that is bounded around in a lot of the books I read about giving birth. While many of those books focused on "natural" birth being the optimum environment for a fear-free birth, I have to be honest and say that my fear levels were significantly reduced once I handed over some of the control and a lot of the care to someone else like Inge, my partner and definitely to the hospital staff. As soon as I felt safe and looked after, my body progressed labour much more willingly. Those hours when I was alone and psyching myself up to be a hero who pushed her 4+kg baby out with no pain relief and minimal assistance were the hours when things progressed the least. It's not for me to say whether my assessment is accurate and whether my labour would have taken the same path if things were different. I can't possibly say that because it went the way it went and it can never happen again and play out any differently. Again, I know that I am lucky that I can find calm and peace with this. It's impossible for me to tell anybody to birth without fear, because it's not an experience that lends itself to feeling free of fear, sadly because of the way labour and childbirth is portrayed in the media and subsequently in the conversations we have. So let me start by beginning a new and different conversation with you. "Giving birth was scary, and huge, and life-altering... but it was also empowering, beautiful and life-affirming... It didn't go the way I wanted or expected, but I know that I did everything I could. I know that I went beyond what I thought I was capable of. I know that I occasionally felt fear, and that I felt comfort when I let others soothe me. I'm proud of all of these things... Now tell me what you're proud of about your birth experience?"